has been enamored of radio since his first appearance on the air at the age of five, playing his violin on an early Sunday morning religious program sponsored by his grandma's church. Davis broadcasting career started in Boise, Idaho in 1954 and continued in Spokane, San Francisco, Denver, Kansas City, Portland, Los Angeles, and a few other places. Davis enjoyed blues from the first time he heard Louis Jordan and Ray Charles on the radio and in recent years his radio programs have focused primarily on blues. He produced his first all-blues series in Oregon in 1989. Moving back to his old home town Boise the following year, he hosted three blues shows on two Idaho stations and became a co-founder of the Boise Blues Society. He started writing features and reviews for various blues magazines. In 1991, he signed on with KLON, Long Beach, to host two weekend blues shows, and two weekly jazz programs. 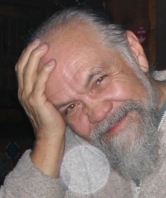 He moved to Portland in 1994, served a term on the Cascade Blues Association Board and began producing Midnight Flyer, a three-hour blues show, on KBOO. The show was syndicated later and began airing on stations around the country in August 1998. Davis has enjoyed interviewing many blues performers including: Roy Buchanan, Jimmy Reed, Honeyboy Edwards, Hubert Sumlin, Gatemouth Brown, Barbara Dane, Snooky Pryor, John Mayall, Coco Montoya, Roy Rogers, Jason Ricci, Eddie Shaw, Kelly Joe Phelps, Paul deLay, John Nemeth, Odetta and others. He enjoys a wide variety of blues and his favorite artists are Muddy Waters, T-Bone Walker and Albert Collins.